Book a taxi from Delhi to Agra starting at Rs.5,280 onwards. Car Rental services available for all cab types AC, Non AC, Economical, SUV, Sedan and Tempo Traveller. Subscribe for sparkling news from Getmecab and receive exclusive offers. The newsletter is published every month, announcing product launches, promotions, events, trends and much more. Get assured lowest price on booking a cab for outstation trip from Delhi, Mumbai, Bangalore, Chennai, Pune, Gurgaon, Hyderabad, Ahmedabad, Aurangabad, Jaipur. Book now! Hassle free cab booking where you do not have to shell out money as fee for booking a Taxi online. Check the details in the page. Now earn Rs.500 for each friend who books a ride from GetMeCab. Your friend gets Rs.200 discount on ride. Start referring now! Book a cab online and get lowest price guaranteed. Offer Valid in ten cities only- Delhi, Mumbai, Bangalore, Chennai, Pune, Gurgaon, Hyderabad, Ahmedabad, Aurangabad, Jaipur; Valid only on outstation return rides. Get ₹500 off on per ride with GetMeCab. Offer Valid in ten cities only- Delhi, Mumbai, Bangalore, Chennai, Pune, Gurgaon, Hyderabad, Ahmedabad, Aurangabad, Jaipur. Valid only on outstation return trips, for a minimum of 1 day travel. Valid only after presentation of written proof like email from a registered cab vendor with a registered website. Can't be clubbed with any offer. Cancellation charges are applicable on cabs booked through GetMeCab. Book your ride without any hidden cost. Valid in all the major cities including Delhi-NCR, Mumbai, Bangalore, Chennai, Hyderabad, Jaipur etc. Hurry up!! Hire a taxi from Delhi to Haridwar starting at Rs.5,496. Available all cab types AC, Non AC, Economical, SUV, Sedan and Tempo Traveller. Book a cab and get one way drop off from GetMeCab. No roundtrip charges for drop. Valid only in select cities like Delhi, Mumbai, Pune, Bangalore, Jaipur for select destinations. 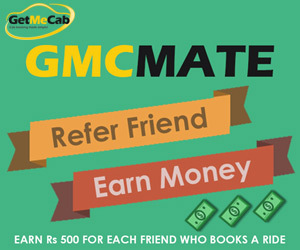 Register with GMC Mate and refer as many friends who are planning to book a cab for outstation travel. You will get a Rs.500 cash straight to your account, and your friend gets a Rs.200 discount. Book a Cab For One Way Only !! Now book a cab for one way only from many cities including Delhi, Mumbai, Pune, Chennai, Gurgoan, Jaipur, Chandigarh, Bangalore & many more. Get the cheapest price challenge on outstation trips at GetMeCab. Offer Valid in ten cities only- Delhi, Mumbai, Bangalore, Chennai, Pune, Gurgaon, Hyderabad, Ahmedabad, Aurangabad, Jaipur. Book Now !! Enjoy the hassle free cab booking where you do not have to shell out money as fee for booking a Taxi online. It stands out for clean-cabs, on time services, courteous drivers, 24*7 support and transparent billing. Get extra Rs. 150 off on Hiring a Taxi Full Day & get extra Rs. 250 off on Taxi on Outstation Cab Booking. Grab this amazing offer. Get Me Cab currently have services in Delhi-NCR, Mumbai, Bangalore, Hyderabad and Jaipur and they will soon be expanding to other cities in India as well.